£6 to watch Charlton ? On occasions this season it's been too much to pay ! Football on a Sunday due to Wigan's Europa Cup involvement and the clocks go back an hour at 3am in the morning purely to give the Latics an extra hour's recovery time. At least we all get an extra hour in bed. Given that the week that follows is half term that the game is being played on this particular Sunday is most welcome as it allows me the enjoy my ale as usual. As part of that I'm hoping to get along to The Old Loyal Britons pub in Greenwich for a few post-match beers. This pub opened earlier this month and is run by a Charlton fan. The beer looks good so should be a treat. The free Saturday gives me the opportunity to return to St James Park to see how Brackley Town fare in the next round of the F.A. Cup. Their opponents are fellow Conference North team Barrow who will be making the long trek south. Brackley are 4th in the league with Barrow in 17th so one would expect a home win but hey, this is the cup so an upset can't be over-ruled. One hopes that Wigan will have a very tiring game against Rubin Kazan with the Russian side making them run all over the pitch chasing the ball. Hopefully our boys will then be fresher come Sunday. 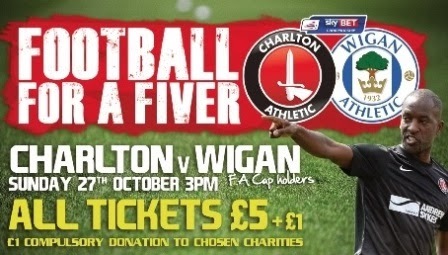 I can't recall the last Charlton game I saw on a Sunday. I remember my first which was away to Orient and I recall being given a team sheet rather than a programme which I guess was due to trading laws perhaps and not being able to sell programmes on a Sunday ? I also recall Stan Bowles coming out much later than the rest of players and only just in time for kick off. Perhaps he set his clock too far back ! As we're now unbeaten in 3 and have kept clean sheets in the last two one ought to be optimistic for something from the game. However, we never seem to do well when we should be the fresher side and I'm always gloomy about our chances ! On the plus side Yann should be on from the start. Not sure anyone should give way for Skip and certainly not Cousins..........I'll be very unhappy if that happens. Sir Chris loves Jacko of course so it wouldn't surprise me to see him back in from the off. Wigan have a very talented side of course so this will be a tough game and no mistake. Hopefully the gaffer will be positive and approach the game in that state of mind. Our negative tactics and long ball game hasn't served us well at home to date so it's definitely time for a change. I take it everyone enjoyed Redknapp getting hit by the ball against Millwall, very funny especially as he missed the equaliser ( no, not Edward Woodward ). Interestingly the highlights showed Redknapp turning up on crutches, however, they nowhere to be seen when he got hit and he should a neat turn of foot as he tried to discover who'd done it.........hilarious ! I'm really looking forward to Sunday.